The European Space Agency's Solar Orbiter spacecraft, due for launch in early 2017, will be built in Britain under a $400 million contract signed Thursday with Astrium. ESA and Astrium signed the contract in London during a celebration of the 50th anniversary of British space activity, which began in April 1962 with the launch of the Ariel 1 satellite from Cape Canaveral, Fla. Solar Orbiter will also launch from Cape Canaveral. Liftoff is currently projected in January 2017 aboard a United Launch Alliance Atlas 5 rocket provided by NASA. "Today, ESA awarded a very important contract in the space science domain to Astrium's spacecraft design and build facility at Stevenage in the UK," said Alvaro Gimenez Canete, ESA's director of science and robotic exploration. Valued at 300 million euros, or nearly $400 million, the contract is one of the largest ever signed between ESA and British industry. "This is testimony to the important role that the UK has played in space flight since the launch of Ariel 1 in 1962 and it is testimony to the important role that the UK continues to play in space science," Gimenez Canete said. After gravity assist flybys of Earth and Venus, Solar Orbiter will reach an orbit passing as close as 26 million miles from the sun, less than one-third the average distance of Earth. Solar Orbiter will fly inside the orbit Mercury, becoming the first spacecraft to approach so close to the sun. NASA's Solar Probe Plus mission will blast off in 2018 and reach a perch even closer to the sun - just 3.7 million miles - in 2024. "I am delighted that Astrium has won Solar Orbiter, which reaffirms our leading position in science and exploration missions," said Colin Paynter, head of Astrium UK. "Solar Orbiter is the second prime contract awarded by ESA to Astrium in less than six months. This contract builds on our unrivaled heritage in solar missions, which includes the SOHO satellite, which is still operational after 17 years providing valuable data for solar scientists across the world." The 1,800-kilogram, or 3,968-pound, probe will reach its science orbit in 2020. Subsequent flybys of Venus will gradually alter Solar Orbiter's trajectory to move closer to the sun's poles through the 2020s, obtaining the first remote sensing imagery of the sun's highest latitudes, according to ESA. The mission will last at least seven years. Solar Orbiter will sample the solar wind shortly after it is ejected. The spacecraft will also include remote sensing imaging instruments to observe the sun's corona and the solar atmosphere. "Solar Orbiter is a fantastic mission," Gimenez Canete said. "It will help us understand how the sun, essential to almost all life on Earth, forms the heliosphere and the origin of space weather, which can have an enormous influence on our modern civilization." 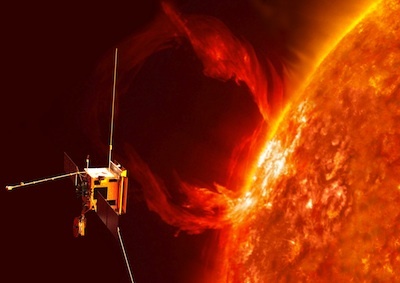 Scientists hope Solar Orbiter will unravel how the sun influences the solar system by determining the origins and causes of the supersonic solar wind, the sun's magnetic field, and massive eruptions from disturbances on the sun's surface. Spawned by the sun, space weather phenomena can disrupt communications, electrical grids, and satellite operations. ESA last year selected Solar Orbiter and Euclid, a probe to study dark matter and dark energy in the universe, as the agency's next medium-class space science missions. Euclid will follow Solar Orbiter in development and launch in 2019. NASA's primary contribution to the European-led Solar Orbiter is the launch vehicle and components for two of the instruments in the probe's scientific suite. ESA is providing the spacecraft and ground system, and the bulk of the science payload comes from ESA member states. The European Space Agency is budgeting about 500 million euros, or $660 million, for its mission responsibilities. NASA expects to spend approximately $400 million on the Atlas launcher and U.S payloads, bringing Solar Orbiter's total cost to more than $1 billion.